On January 11, the Africa Growth Initiative at Brookings released its annual Foresight Africa publication. This year’s report focuses on six key priorities for the region in 2019. The first chapter, Bolstering Good Governance: The imperative of inclusion and efficiency, highlights recent progress and challenges facing the continent, with emphasis on improving youth representation and inclusion in government. Given this focus on youth representation and inclusion, Figure 1.4 from the report presents some data on the issue. As the top figure shows, the median African leader is eight years older than the median OECD leader. As the distribution highlights, most African leaders are over 55 years old with several leaders over 75 years old. This contrasts sharply with the continent’s very young population at a median age of 20 years old. The age gap between the region’s population and leaders is also much larger, at 42 years, compared to the OECD’s 12 years. 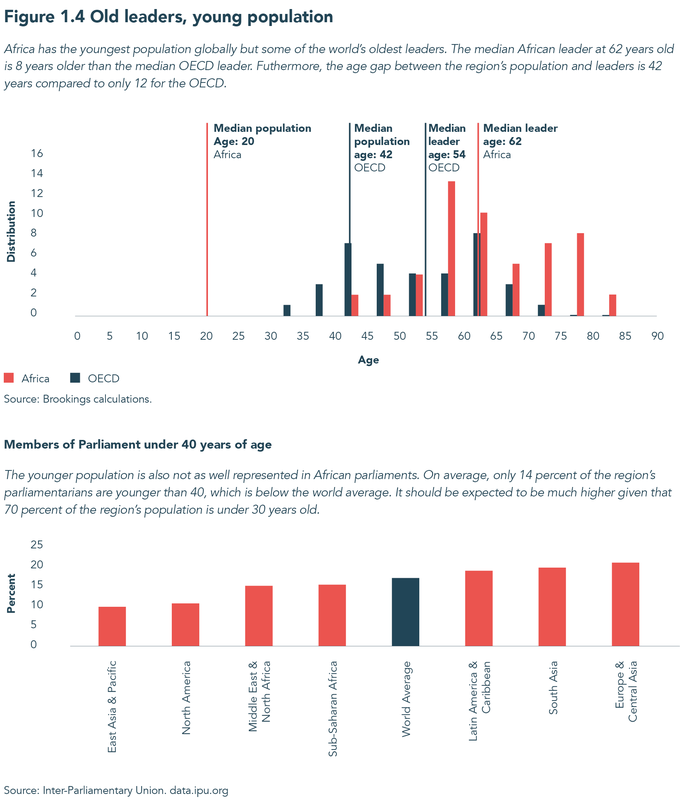 Looking at parliamentary representation, 14 percent of sub-Saharan Africa’s parliamentarians are under 40 years old, close to the world average. However, it should be expected to be higher given that 70 percent of the region’s population is under 30 years old.